Craft brewery targeted direct mail piece for Cranky Pressman. You’ve probably noticed there are a ton of breweries around these days. The names of these brewing companies and their offerings cover quite a range. There’s the workmanlike; the geographical; every imaginable animal species (plus some that are beyond imagination), and a few names that are just plain odd. Add to this the encyclopedic-sized list of beer names and it’s not surprising how difficult it is to stand out. We created a direct mail piece that pokes fun at some of the silly beer and brewery names out there and the challenge brewers have making their brand stand out. Serve it up with the tasty feel of letterpress. Mailer contained 3 sample coaster plus offer information. 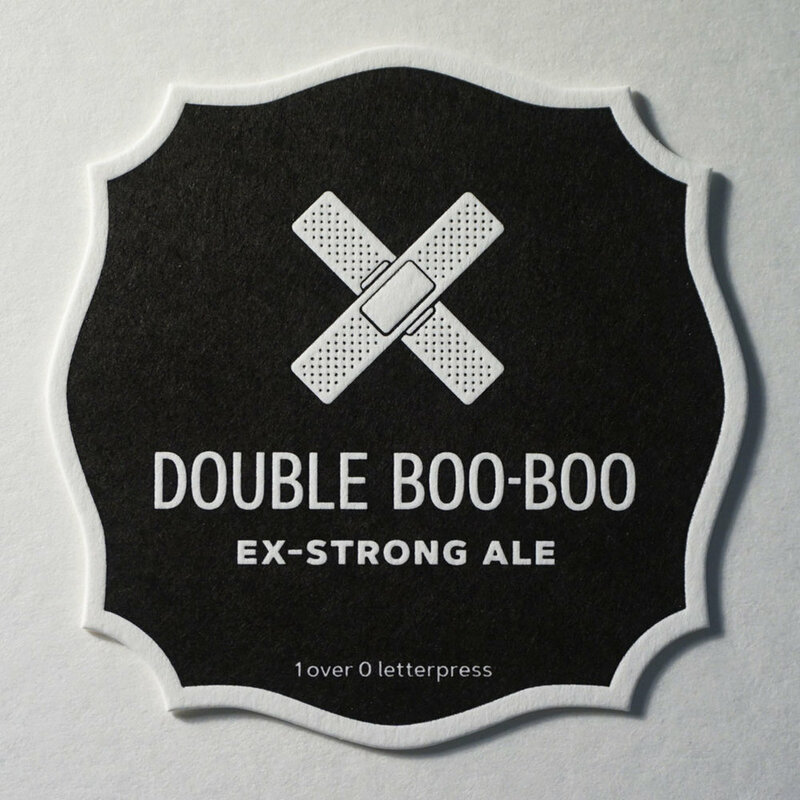 Quintuple IPA, coaster printed in 2-colors. Ex. Strong Ale, coaster printed in single-color. 2-color letterpress coaster with additional information printed on back. Brand your brewery. Brand your brews. Brew your branding. Information about Cranky Pressman's letterpress services are detailed on back cover and mailer inside spread. A crucial ingredient in the brewing process. 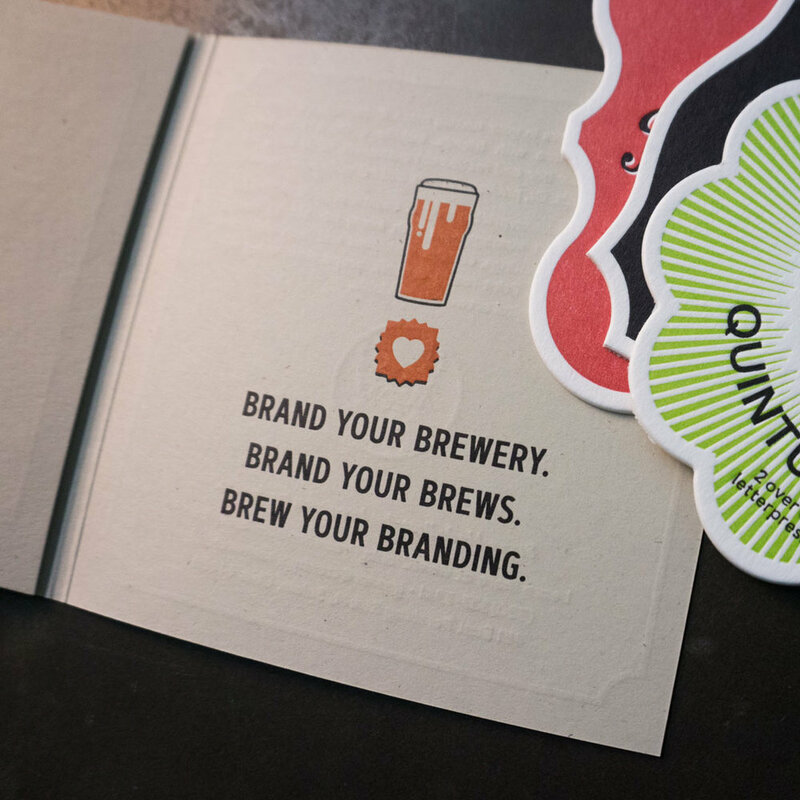 Building a memorable brand is part of a successful brewer’s to-do list. After all the hard work of producing a great beer, the job is not done until the brew is named, launched and promoted. And just as every barrel rolled out reflects on the brewery’s reputation, so does the personality and style conveyed by the brew house and line of beers. The mailer compares creating distinctive branded messages to producing tasty beers. Both require fine craftsmanship and quality materials. Letterpress is old-school traditional printing done on machines from a bygone era. Cranky Pressman produces custom printing much like you brew beers - with dedicated skill and care. The distinctive tactile look and feel of letterpress coasters stands out to customers and communicates the quality your brand stands for. Pair with the perfect shape. Die-cutting is the final step in a letterpress coaster production. With Cranky Pressman coasters you are not limited to a regular round or square shape. We have 12 different standard shapes to choose from, all are included in our normal price. Like matching a glass to a beer, choose the shape that best suits your logo and graphic design. The various components of the piece were designed to work in both print and online to help Cranky Pressman reach a new market of fellow craft businesses. This little video is being used on social media along with photographs of the printed product Cranky and his crew offer. Direct mail is an effective way to reach potential customers in a more personal way. If your business can use a print-thru-online message, give us a call to discuss the possibilities.